Hello everybody! Today after talk to DJI support about why Phantom 4 head and gimbal tracking doesn&apos;t work with DJI goggles they told me "unfortunately the the DJI Goggle don&apos;t work with phantom 4 series, and only work with Mavic pro and also he said maybe never will in the near future. Im feeling very frustrate about! Support Head Tracking, Intelligent Flight Modes, and Live view. Support only Live view. Aircraft operation is not supported. He said he can&apos;t give me any explanation about it! Now i don&apos;t know if the goggles its worth to keep it or return because i have no plan to buy a mavic Pro because i just bought the spark fly more! apparently they did this just for sale! the customer support was direct on the answer to me saying the head tracking on phantom 4 series its not compatible! We are so sorry for the confusion you have been caused by the support agents. The Phantom 4 series can work with the DJI Goggles, but some functions may not be available. Here is the functional support list below for your reference. We understand that you all want the googles more functional with different aircraft model, so do we. We&apos;ve transferred your requests to our engineers, we&apos;d like to develop more functions on it if it is possible. Hi. 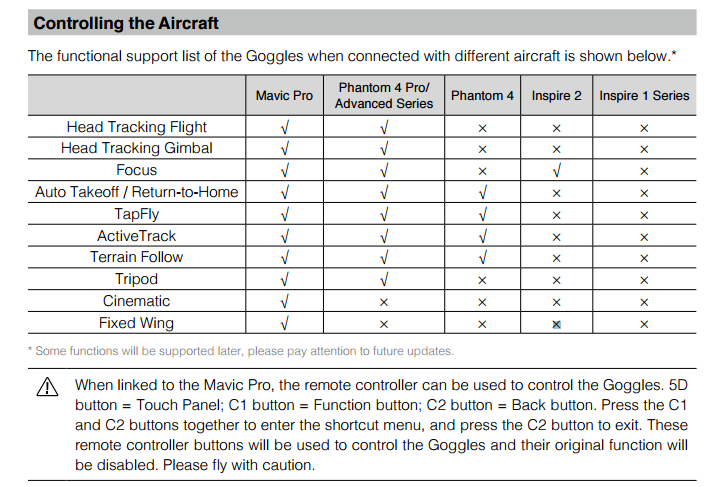 The specs for the Goggles originally stated that full functionality would be offered for the P4, although at that time I believe that marketing expected the latest firmware update would be out to provide the P4 with intelligent flight mode features (which were beta tested back in January). However, release of that firmware didn&apos;t happen, and DJI focussed on firmware releases for the P4P, P4A, Inspire 2, Spark and Osmo instead. DJI then made a quiet correction to the manual and specs to state that the P4 was not fully compatible - just for the basic features. Many view this as simply being &apos;bait advertising&apos;, but I believe it&apos;s just been a case of poor release management. DJI keep suggesting that they will still release this firmware update for the P4, but will not provide an ETA. When it happens, the P4 should have full functionality with the Goggles. Are you sure we will get head tracking? Like did it ever during beta? From the crappy support replies I got from DJI and their lack of grammar they said no. I&apos;m super pis sed right now. Are you sure we will get head tracking? Like did it ever during beta? From the crappy support replies I got from DJI and their lack of grammar they said no. I&apos;m super pis_sed right now. Thank you for the update. How does DJI plan to compensate the Phantom 4 owners who purchased the DJI Goggles based on the original specifications that were the same as the other P4 models please? Hello to Diana i like to see you answer that question! Because iam very frustrate right now too! What i believe its this: Don&apos;t advertise somenthing if its not true or will not happen! She won&apos;t, she can barely type English properly! Basically useless! They won&apos;t do anything for us! If you&apos;re that disenfranchised then you should take your Goggles back to the retailer and ask for a refund. Not sure but I imagine US & Canadian law would be similar to that of UK & Europe, where in this case the product &apos;was not as described&apos;, &apos;not fit for purpose&apos; (or whatever wording) when it was sold to you. DJI Dianas English is certainly very good and light years ahead of any foreign language skills I posses. Remember these are frontline retail people and are unlikely to have any more information on a release than we have. I would tend to go with Punchbuggys understanding. DJI have a ready made market for the Goggles in the P4s already sold, and it would seem daft not to take advantage of that if it is technically possible. Who knows the Beta tests may have thrown up some problems not previously seen. I&apos;m politely asking for DJIs policy on the matter. I purchased the Goggles directly from DJI and I am outside of the published window to return them. There&apos;s no need for anyone to disparage the moderators. They are doing the best they can and just need some direction from their supervisors. Hey, I can understand your frustration, but as Aardvark points out, it&apos;s not appropriate to take it out on the moderators and support staff. I doubt that they are in the loop for firmware releases, and lack full details of the features and fixes (and residual issues known by the engineeers) within them. The Goggles debarcle is just indicative of another internal disconnect within DJI. Just remember that the support people here walk a fine line - a line between legitimately wanting to help customers here, and being able to maintain the DJI &apos;party line&apos;. I&apos;m sure that they are given regular instruction on what they are able to say, and what they aren&apos;t.
Regardless, the delay in releasing new firmware for the P4 after it being openly tested last December-January is one thing, but the false representation of full functionality of the Goggles with the P4 during it&apos;s release (and first run of purchases) is another. In many countries, the latter would lead to their trading being halted or being heavily penalised due to misleading product advertising. DJI need to adddress that, as it falsely guided many peoples purchase decision. Of course, release of a P4 firmware which returned this promise of full Goggle functionality would be a resolution. I&apos;m totally agree with your 3rd paragraph in your comment! I hope they are looking to fix this! Like I said to you I did a direct call and they didn&apos;t promise me anything! Let&apos;s hope for the best!!!! Meh, still pis_sed. I did get to try them finally and the horizon line was saying my p4 was sideways and i took off the goggles and it was fine. I really hope they fix these goggles. It&apos;s stupid I have to run 2 dji assistant 2 programs, one for my p4 and one for the mavic to use the goggles. With the latest updates of the glasses and ghost 4 if it works well. What is not enabled is the tripod mode. Con las últimas actualizaciones de las dji goggles y el phantom 4 si funciona bien. Lo que no está habilitado es el modo trípode. My Phantom 4 (standard) does support head and gimbal tracking but there is another BIG problem. The new DJI software requires that the user be connected to the internet to fly more than 30 meters but the goggles do not connect to the internet and the hardware does not allow you to connect the phone and the goggles at the same time so yu are limited to 30 m horizontal and 30 m vertical. I also have a Mavic and this is not a problem since you connect both at the same time. Can someone please confirm that the gimbal tracking issue with the P4P is resolved? Besides this, is there any restriction using the Goggle with P4P as opposed to using it with Mavic Pro? In other words, are there any disabled/unfunctional features when using the Goggle with the P4P? Yes the issue it’s resolved after you upgrade to the latest firmware! Folks I am new to the drone world. Suggestions on best way to connect P4P (have now) with Crystalsky display (on backorder) and contemplation of DJI Googles to ensure I have HUD at all times on the display and the goggles? I have seen some youtubes (possibly now outdated due to firmware updates) that suggest the HDMI connection to the goggles does not carry the HUD. Not sure if I need to buy the HDMI module for the controller (or use HDMI out of the hopefully soon to arrive crystalsky), new/special cabling, etc. All the talk about the lack of focal adjustment on the googles as well as very, very, very apparent substandard support is disturbing. Not trying to be derogatory, the company clearly is very capable which suggests their orientation is disproportionately about sales than customer care.....rant aside, really would appreciate figuring out what is needed to make the P4P, Crystalsky and Goggles work with greatest functionality before I give them anymore money.